How to play like the Grateful Dead? Relax. Jeffrey Pepper Rodgers teaches acoustic guitarists how to play Grateful Dead songs — which, he acknowledges, is a contradiction in terms. The Dead never played their songs exactly as they sounded on their studio albums, instead reinterpreting them in pretty much every performance. And since improvisation was the foundation of their shows, each live rendition was unique. So “learning” a Grateful Dead song is quite a different proposition from learning to play, say, “Yesterday” by the Beatles or “Wonderwall” by Oasis. During a recent interview at the school, Rodgers demonstrated his approach: He teaches the basic chords of the song, adds in leads, inversions, and other embellishments that capture the feel, and encourages his students — who range from low intermediate to experts — to do the same. Deadheads will understand what he means. For the uninitiated, listen to the upbeat, bluegrass-infused studio recording of “Friend of the Devil,” one of the group’s most familiar tunes, and contrast it with the swaying, shuffling, crescendoing ballad that would unfold in the band’s concerts. Or contrast the folksy studio version of “Uncle John’s Band to the jazz odyssey it could become in live performances. Of course, the Dead’s uniquely democratic approach to how a song plays out — “like a car where everyone’s hands are on the steering wheel,” Rodgers describes it — can be a turnoff to people who like their rock and folk crisp, rehearsed, and accessible. At its worst, the band could sound like a lot of people murmuring out of key to the tune of an electric dirge. So, how does one learn to play the Dead and not sound like that? Rodgers’s advice is not to worry about it. “Thinking too much about what you’re doing is always the enemy of playing well,” he said. “The only way that I know that it ever works is just to feel where the music is going and shut off that thought process. 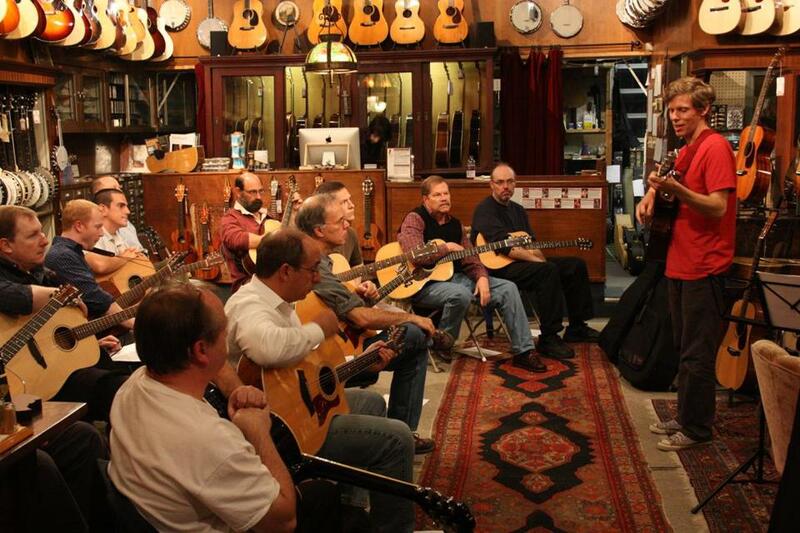 Jeffrey Pepper Rodgers, far right, led his workshop, “Grateful Dead for Acoustic Guitar,” at the Music Emporium in Lexington in 2013.